by Roth, Melinda, La Russa, Tony, Fox, Michael W.
Roth, Melinda, La Russa, Tony, Fox, Michael W.
With a new afterword about Quentin, the "miracale" dog who made national headlines by surviving a gas chamber Go to Any unpopulated or Abandoned urban area, and you'll find them. Countless wild dogs-abandoned to disease, starvation, and inevitable death-are leading brutal lives in the no-man's-land between domestication and wildness. A lucky few are saved by dedicated rescuers, and Randy Grim, founder of Stray Rescue of St. Louis, has become one of the country's leading dog saviors. 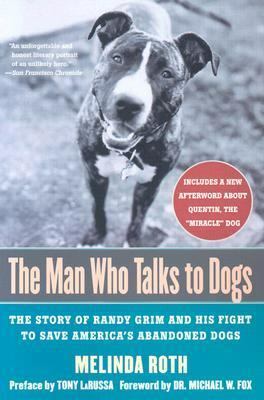 In this book, journalist Melinda Roth narrates Grim's dramatic efforts and describes the horrific and heartwarming cases he encounters, showing how this growing national health problem-controlled by no federal or local laws-can no longer be ignored.Roth, Melinda is the author of 'Man Who Talks to Dogs The Story of Randy Grim and His Fight to Save America's Abandoned Dogs', published 2004 under ISBN 9780312331047 and ISBN 0312331045.